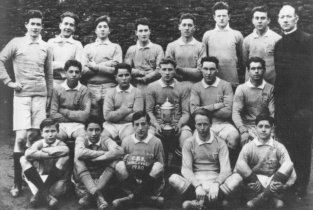 Cahersiveen CBS, Dunloe cup winners, 1930. Sigerson is standing far left. This little gem became a favourite of ours while recording the album. It is written in the same style as 'The Races' and captures a time of innocence when any out-of-town visit was seen as an exciting and colourful experience. Sigerson's own notes on this reads - Bazaar: a travelling, open-air show. The talkies killed most of them unfortunately. Clawhammer: old-fashioned coat with tails to it. The football and the beagles and the dancing by the Mill. The great diversion that we had was when the Missioners came. So they blessed our beads and left us and the night flowed back once more. We saw the lights that marked the vans of Lenihan's Big Bazaar. Or to gamble for the trophies in the lovely Chaney stall. And he took a sup out of the cup I won in the Bazaar. The dancing and reciting and the sketches drawn from life. And we cheered the men who sketched them Seán O'Grady and Malone. He roofed the sky with smiles for slates in Lenihan's Big Bazaar. And tripped her way into the heart of one small watching boy. When I saw her smile at Boxty Walsh in Lenihan's Big Bazaar. And the fine old all-for-Ireland songs that had no right to die. And we loved them as we heard them pay their tribute to the green. The kindly glow of lights long quenched in Lenihan's Big Bazaar.